Need help figuring out which Winstep product is for you? It is often said that a picture is worth a thousand words, therefore below you have a screenshot comparison of what you get with Nexus, Nexus Ultimate and Winstep Xtreme. Nexus features a single dock. Nexus Ultimate features multiple docks, sub-docks and the Shelf (tabbed dock). 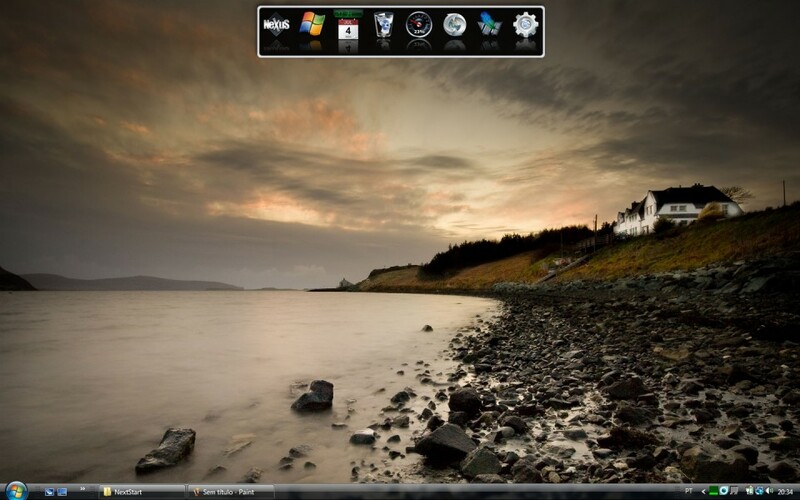 Winstep Xtreme features multiple docks, the Shelf, Desktop modules, skinnable context menus, user-defined menus and a skinnable Windows taskbar replacement. The following table compares features of the different products, using the free version of Nexus as the base. Access favorite applications from a dock featuring 18 amazing mouseover effects. Display system tray on the dock. Create as many docks as you need. Organize applications into nested sub-docks. Categorize applications into user-created tabs on the Shelf. Display the contents of folders in your hard drive, Windows Desktop, Control Panel, and more, as tabs on the Shelf. Reduce clutter by hiding Desktop icons and using the Desktop tab on the Shelf. Switch themes quickly via the Themes tab on the Shelf. Maintain a consistent look and feel with skinnable context menus. Show Winstep modules/widgets on the Desktop. Create your own menus with the built-in Menu Editor. Open menus and launch applications via hotspots and screen edge bumps. Replace the Windows taskbar with a highly customizable and skinnable alternative. Organize Start Menu shortcuts into user-defined categories. Winstep Xtreme is the name of a suite of applications, a bit like Microsoft Office includes Word, Excel, etc... This suite includes all available Winstep applications: WorkShelf, Nexus Ultimate, Desktop Modules, NextSTART and the Start Menu Organizer Pro. Winstep Xtreme Basic is like Winstep Xtreme but does NOT include the Pro version of the Start Menu Organizer, only the free version, which does not allow you to create new Start Menu Program categories. The Basic version of Xtreme also misses the fabulous '1,000 dock tiles' bonus pack. Winstep Xtreme Home Network is Winstep Xtreme with a license of up to 5 users. Nexus Ultimate is a sub-set of Winstep Xtreme. While Winstep Xtreme is an extremely powerful tool oriented to power users who like to change the way the Windows UI works and customize it to their own needs (e.g. ; Xtreme is more of a Shell replacement), Winstep realizes not everybody wants this. Because it does so much and is therefore more complex, Winstep Xtreme also has a steeper learning curve than Nexus Ultimate once you want to get past the basics (in my opinion figuring out all that Xtreme can do is actually a big part of the fun, but not everyone feels the same way). Xtreme can be a bit overwhelming for some people, who might just want a simple utility that sits on top of the normal Windows UI. This is where Nexus and Nexus Ultimate come in. Nexus is the FREE version of Nexus Ultimate. It only allows a single dock, and does not support sub-docks or the Shelf (tabbed dock). Nexus Ultimate includes the Shelf (tabbed dock) and allows you to setup multiple docks, as well as add sub-docks to your docks. One of the reasons there isn't a trial version of Nexus Ultimate is because Winstep wants users to get accustomed to the simpler UI of the free version before they jump to Nexus Ultimate. By the time users realize they need Ultimate to accomplish more, they already got used to the Nexus way of doing things, and upgrading to Nexus Ultimate is therefore just a natural progression. In turn, once accustomed to Ultimate, users might realize that they want even more and are actually ready to tackle Winstep Xtreme - this being one of the reasons why Winstep provides a direct upgrade path from Nexus Ultimate to Xtreme. Registered versions of Nexus Ultimate have a button in the About tab of Preferences that users can click on to upgrade to Xtreme, for the price difference between the two. So, the natural (or ideal) progression would be Nexus -> Nexus Ultimate -> Winstep Xtreme. Nothing stops you from jumping straight to Xtreme, of course, and you can always turn off features you don't need or like. The Winstep Start Menu Organizer is a stand-alone utility, useful even to people who might not like shell enhancements such as Xtreme or Nexus. The Start Menu Organizer is also included with Xtreme, and, as a stand alone utility, comes in two versions: a free and a Pro version. The free version is limited to a fixed number of categories (Games, Office, etc...), which, being quite general, should be enough for most people. Otherwise, to create their own categories, users must purchase the Pro version. The free versions of Nexus and the Start Menu Organizer exist because 'free' is a very effective marketing method. It works because a percentage of users running the free versions will eventually feel the need for features that exist only in the more powerful paid versions. Those who don't upgrade will still be showing and recommending Winstep applicatons to their friends. Hope this explanation helps. If you're running Winstep Xtreme, rest assured you already have the 'top of the crop'.